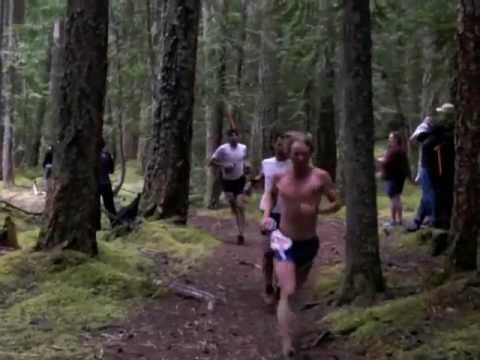 The start of the 2012 Whiter River 50. Photo by Glenn Tachiyama. “Okay you’re in uncharted territory now,” I thought to myself as I glanced at my $35 GPS unit which had just clicked over to 32.0 miles. My longest running effort prior to this magical distance was when I ran the Chuckanut 50k + 1 extra mile. The sun was working it’s way around the hills as I trudged up the second brutal climb of the White River 50. I adjusted my Smith Optics Pivlock 2 sunglasses so I could see the rocks on the trail better. Usually I relish climbs, but this near hour-long uphill effort had started to get the best of me. I walked a couple steps and my legs felt stiff and shakey.. The bright light was giving me a headache (or maybe it was just the dehydration?) and my face felt numb. I had feared the inevitable bonk…”perhaps I had started too fast?” I wondered to myself. The first 30 miles of the race had been relatively uneventful except for the fact that I been consistently splitting about 10 minutes under course record pace at the last couple of aid stations. Since I am a numbers guy ,who does pre-race research online, I had prepared to gauge my pace/effort off of Anton Krupicka’s course record split times from 2010. Before the race that morning I had written all of the split times on my arm with a Sharpie so I could reference them at each check point. I honestly had thought breaking Anton’s time would be a long shot since it was my first 50-miler and I had never set foot on the course. However, once we took off down the gravel road parallel to the airstrip at the start of the race (probably at a pace that was much faster than I should’ve been running at the time) I felt compelled to keep pushing for a faster and faster intensity as the miles clicked by. Going by many of the racers on the out-and-back sections of the course was exciting as the synergy of runners encouraging each other along the trail made me really want to fly. Cruising down a road into the last aid station around mile 43 I kept hearing some horrible pop songs playing over and over in my head: “Whistle” feat. Flo Rida and “We Run The Night” by Havenna Brown ft. Pitbull. [as a piano/guitar player I do appreciate all types of more “quality” music…however we all have our guilty pleasures!]. I think at this point my mind was trying to distract itself from the pain I was putting my body through. I was breathing hard and working out a side stitch. My hands were sticky with energy gels and there was chafeage all over. This whole downhill section was brutal for me because I was obligated to run fast and try to decrease my average mile pace to significantly under 7:42/mile (I had only averaged about 8:00min/mile up until this point at the top of the second big hill). My big toes were getting crushed into the front of my shoes (half size too small go figure) and I felt my left toenail start to crack with each pounding step. After a quick bottle exchange with my mom at the last aid station I headed into the Skookum flats, which proved to be the most difficult part of the course for me. It seemed that the downhill had taken a toll on my quads and I stumbled over the various roots, rocks and bumps this somewhat technical trail presented. Mentally I was at a very low point in the race because my mind was foggy and I was unaware that my cheap GPS had actually lost it’s signal. I kept seeing the “average mile pace” climb upward (this tends to happen when the stopwatch keeps running but the unit is failing to track distance). In my poor mental state I became quite discouraged because it felt like I was running at a consistent pace but the watch made it seem like I was going to be over 8:00min/mile all of a sudden! At this point I had about 6 miles to go I remember thinking that Anton’s record would slip from my grasp. I began to re-adjust my goal, telling myself that cracking 6:30 would be a more appropriate time to go for now considering it seemed like I would never make it out of the woods without coming to a crawl. When I came to the end of the trail (the final turn for home down the road) I was shocked by what the GPS revealed: 49.2 miles! I guess if finally picked up it’s signal and the average pace calculations clicked back down. At that point I realized that I could coast under Krupicka’s course record by a decent margin. In the final quarter mile I waved at my dad, felt my hamstrings almost totally cramp up (when I tired a weak kick), and crossed the finish line without puking or falling to the ground. Photo by John Wallace III : The Finish. Next time I won’t wear shoes quite so small…and perhaps I’ll actually be able to pick up a nice footwear sponsor! 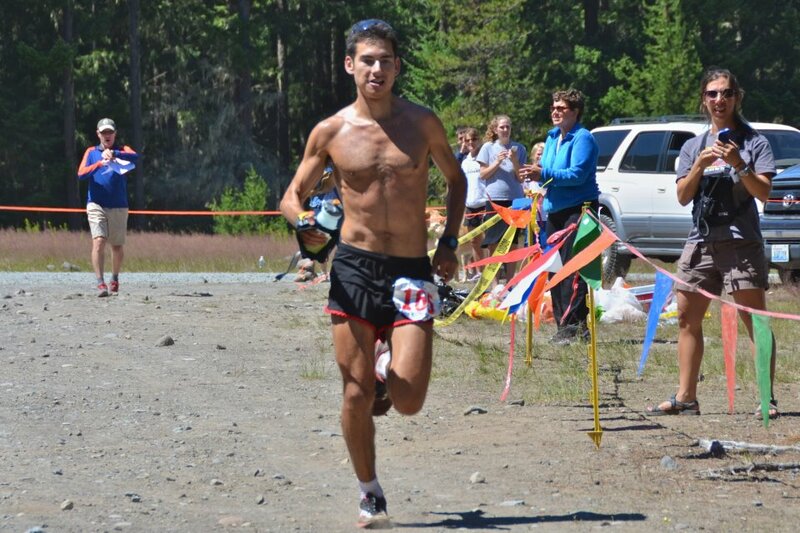 Overall the White River 50 was a great experience and a race that I’d highly recommend to any aspiring ultra runner. 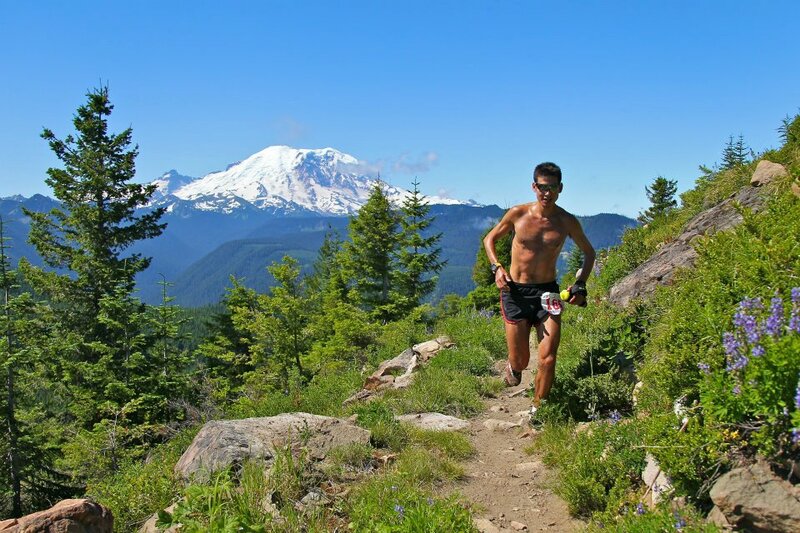 It has some big climbs, a variety of trails, and some gorgeous views of Mt. Rainer and the surrounding hills. All the volunteers and aid stations were very generous and supportive. Finally, I wanted to thank the race directors and event organizers, Scott McCoubrey, Jonathan Busham,and Doug McKeever and all the volunteers for putting on such an awesome event. Thanks! PS. 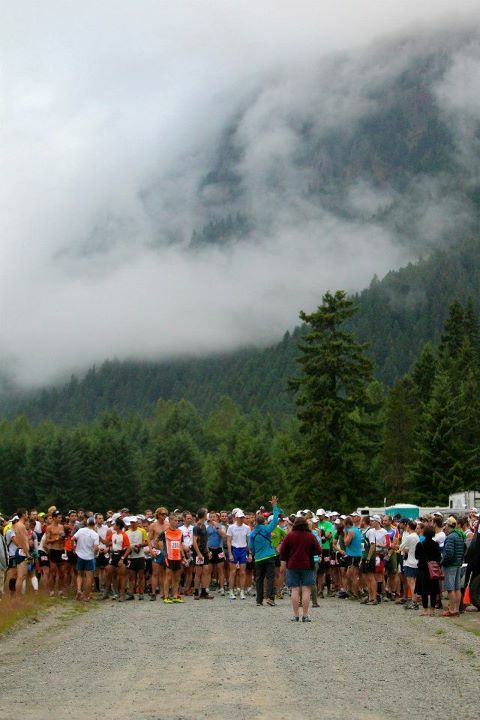 Also congrats to all the finishers of the 2012 White River 50. It was great to be a part of such a nice event with you all! Here’s a little video recap I put together of the race (as filmed from my parent’s cameras). I’d also like to thank my parents for all their support and for also crewing me during the race!